The elite pursuit graphic sits midway between the P.R.O. escape and the Pursuit Attack in price. Interestingly they also sit in the middle of my comfort meter. The chamois of the graphic is much more comfortable than the Attack but not as comfortable as the PRO. My only negative for the graphic is that it lacks the compression of the PRO in the legs. I prefer a more compressed fit and the graphic with the non-slip on the legs being up from the cuff feels loose. The rest of the garment is very comfortable. The value for the product was very good and this makes a suitable mid-length ride kit. Consistent Pearl Izumi quality and comfort. 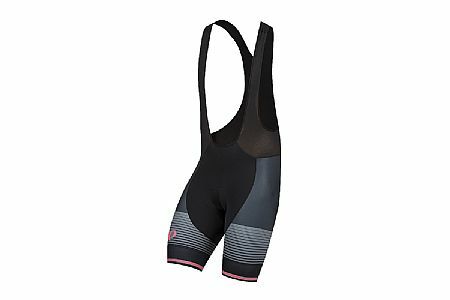 The Lycra material is very light and thin. It is very smooth and it gives the impression that it doesn't provide much compression to the leg muscles. The bib straps do appear to be shorter which makes for a tighter fit. The chamois is free of stitches and the leg openings have retainer material which seems to work well. Was going to return it initially but after several rides it appears to be very comfortable.